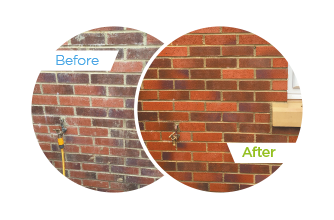 We deal with all areas of brick cleaning and restoration from cleaning away years of dirt from the facades of buildings, to re-pointing the brick work. We have over 10 years of experience in restoring and refurbishing the externals of homes and buildings. Often, decades of air pollution and weather exposure, have an adverse affect on the appearance and integrity of most exposed brickwork. This problem is easily addressed with a combination of our expert cleaning skills and precision pointing. We offer a high level of service and provide an unrivalled quality of work and finish. We liaise on new build projects with architects, designers, builders, property developers as well as domestic householders and we welcome all enquiries. When we are working at your home, rest assured, we will treat it as if it were our own. Our staff are highly skilled, experienced and dedicated to doing the best job possible offering a professional, efficient service. We hold full public liability and employer’s liability insurance underwritten by specialist insurance providers. Valid references are available on request.